its need to be very simple, dont put addons in the original folders anymore, only in the addons folder. it was needed to be simple, just to put the SC1992's Atmosphere collection pak inside the addons folder. only SC1992's Atmosphere collection ? Roswell, just download SC1992's Atmosphere pak, you will see its kind of rar file and inside it models folder..
just dont do anything with the models folder inside this rar. 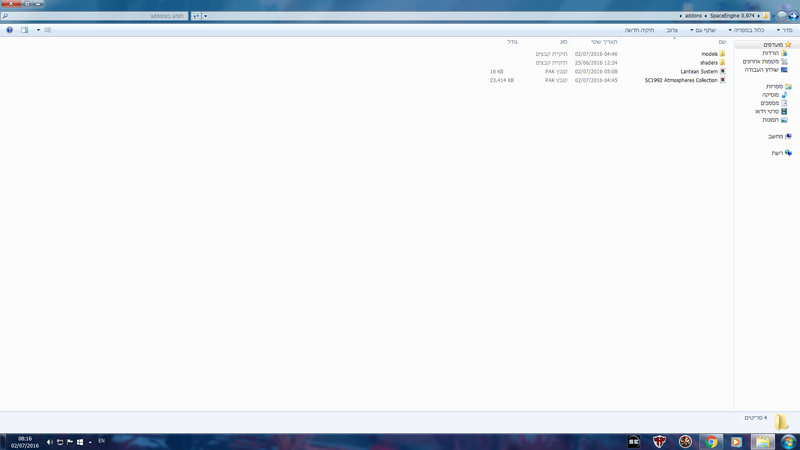 take the rar.pak file you download and put it all in the addons folder, thats it. Ah you mean I need to extract the SC1992's Atmosphere pak. I am unable, even by installing the right place, the problems that continue with the same atmosphere's colors problem, maybe the atmosphere file is not compatible for RC3? i mean when you download the rar.pak file just drag it to the addons folder and that it. First it's amberworld, this color is PERFECT, it's the only colors is work fine. Pinkworld is a bit too pinks I thinks I saw the picture from simon who link here the pinkworld are normal and great, I download the atmosphere and the pink atmosphere is a bit strange. Purpleworld wow, do you see the funny colors. The purpleworld turn into a pinkworld. Ah Rara, funny atmosphere, you can see it. Sangre look like strange Redworld with the dark line around the planet. Shrek seem ugly atmophere if I go into his atmosphere. if you draged the pak file to the addons folder like i told you its need to be all fine. check in the editor what is the height of that planet atmosphere, sometimes strange things happen in atmosphere models when the its too height. did it like that to all planets? No I didn't change, they're all 60 in height. like that. see my pak file is a rar and not notepad. maybe that the problem? try to press right click on that notepad file and then click open as... and open it as rar. then just put it inside the addons folder like in my image.